Thanks to the Extensibility feature we can extend menus and commands, create customized tool windows, editors, project templates, extend user settings, properties in the Property Window, create Visual Studio Isolated Shell apps, and many more. In this article, we will give you a brief look at the capabilities of Visual Studio Extensions. Visual Studio 2015 is a very advanced IDE with a great number of useful options, but sometimes you may find that there are not enough features to meet your needs. Certain operations may be even more automated, or you might prefer to have more project types or languages supported. Sound familiar? If so, there is an easy way to deal with such situations. A while back, there were Macros and Add-Ins to make our IDE more developer-friendly and meet our needs. In Visual Studio 2015, those ways of extending the environment are not supported anymore; instead, there is Visual Studio Extensibility (VSX or VSIX). This possibility was released first in the 2005 version and now is mature enough to give us a great experience with building our own plugins. Thanks to the Extensibility feature we can extend menus and commands, create customized tool windows, editors, project templates, extend user settings, properties in the Property Window, create Visual Studio Isolated Shell apps, and many more. Basically, the only limitations are our needs and imagination. In this article, we will give you a brief look at the capabilities of Visual Studio Extensions. 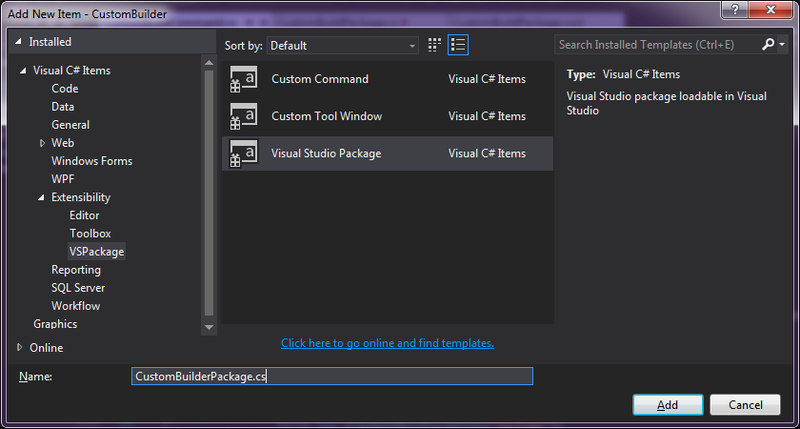 To start with extensions development we need to have Visual Studio 2015 with the Visual Studio SDK. You can get Visual Studio Community for free here: Visual Studio Community 2015 Download. During installation, just select Visual Studio Extensibility Tools, and it will be installed together with other parts of the IDE. If you already have Visual Studio 2015 installed, just open it, go to File/New Project, and expand Visual C#/Extensibility. Choose Visual Studio Extensibility Tools and follow the instructions. Today, we are going to make a simple but still very useful extension which will let us use a custom *.proj file to build solutions using MSBuild. First, let’s create a VSIX Project. To do so, go to File/New/Project, and then choose Extensibility/ VSIX Project and specify the name. In this case, it will be CustomBuilder (fig.1). 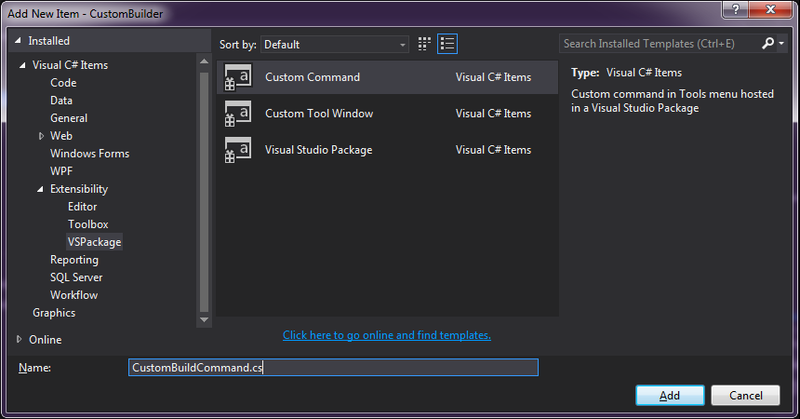 Visual Studio has generated a Getting Started Visual Studio Extensions help page. You can delete these files because you don’t need to use them (unless you’d like to read it). Delete index.html and stylesheet.css but keep source.extension.vsixmanifest–we’re going to use it later. Now we need to add a package, by adding new item to our project (fig.2). We want our package to be available only while a solution is opened. To restrict the user from using the option, add attribute ProvideAutoLoad to the CustomBuildPackage class and add the following code before the class definition (fig 5). To customize the appearance of our command, you can specify some layout options in CustomBuildPackage.vsct file. Change <ButtonText> tag to set the text that will be displayed in the Tools menu. To generate a number to the value attribute, open the Tools menu and select Generate GUID. 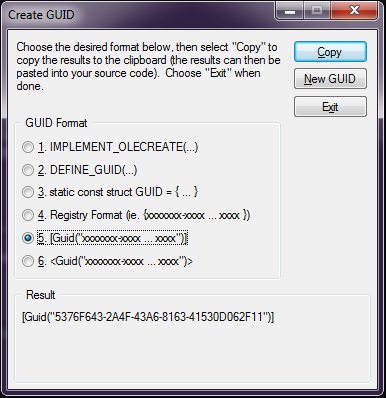 Now click 5th format, Copy generated GUID, Exit the tool and paste it into your code (fig. 7). You have to specify which picture you want to use. Put a *.png file in Resources folder under your project directory (the icon should be 16x16 px) and add this code to <Bitmaps> section. Where key1 specifies an alphanumeric key or VK_constants, mod1 is any key from: CTRL, ALT, and SHIFT. Now our command should look like Fig. 9. This class runs the MSBuild.exe process, builds the opened solution from the custom *.proj file (if the project contains any), formats and redirects output of the MSBuild.exe process, which can be displayed to user from our extension. The constructor of the class accepts a string with solution’s path and stores it in a field, so it can read it later in a suitable method. The public method BuildSolution() gets the right MSBuild path (using getter of a property msBuildLocation), starts the msbuild.exe process with the solution path as a parameter, reads the output from console (using string builder), and returns formatted result – with a header "CustomBuilder – Build - <solution name>”. We can display the result in the output window (the same way Visual Studio informs whether the build solution succeeds or not). In order to do that, add the following code to the CustomBuildCommand.cs file (just below existing methods). var pane = GetOutputPane(PaneGuid, "CustomBuilder Output", true, true, message);    pane.OutputString(message + "\n--");    pane.Activate();        // Activates the new pane to show the output we just add. After you’re done with the development of your extension and you’re sure it works fine (double check! ), you can share the extension easily with other developers. First, you have to open source.extension.vsixmanifest and specify some information about your extension. You should fill in all metadata information, target versions of Visual Studio, dependencies, and other known information. There are two supported ways to distribute your extension. First, you can just share the *.vsix binary file of your Visual Studio Extension–e.g. send it by email, send a link to ftp/cloud or distribute as you wish. You can find the file in the bin/Release folder of the solution (if you built a release version of your extension). All the recipients will have to do is to download the file, close Visual Studio, double click on the file, and use the installation wizard which is straight forward. On the next few screens, you have to input some information about your extension such as Extension type–whether it is a tool, control, template or storyboard shape (which applies only to PowerPoint, so not here). After you have specified the type of your plugin, you can choose where you will store the *.vsix file. You can upload it to Microsoft servers or share a link to some custom location on the Internet (e.g. if you have your own server). After you have uploaded (or linked to) the proper extension, you can add Basic information. Some of this is filled in automatically based on our source.extension.vsixmanifest from the project, like the title, version or summary. You can choose the category and add some tags to help users to find your extension easily. In the Cost category you can specify whether you want to sell your extension (Trial or Paid option) or provide it for Free. A really nice feature included here is the option to share a link to your code repository if you want to let users browse through your code. You have to also provide more information about your plugin. In the Description field, you can use given templates or create your own document about your extension. Videos and images can be included so you can fully present your plugin. Later you have to agree to the Contribution Agreement by checking the box and click Create contribution button. After saving process your extension is not published yet, but you can Edit, Delete, Translate, or Publish your project to finally make it live. Now it’s easy to find your plugin oin the Visual Studio Gallery website or in Extension and Updates in your Visual Studio by typing in the name or keywords which were specified while uploading your project. The extensibility feature in Visual Studio 2015 is very easy and straightforward, as you can see. You create a project as you’d create a simple console application in Visual Studio, and you can share it too, easily extending the functionality of your IDE. Published at DZone with permission of Marcin Kawalerowicz . See the original article here.